Compliance is one of the top challenges facing any payroll and HR department. It’s up to you to ensure that all personnel business practices follow current laws and that you are keeping proper records to document your company’s compliance. While an efficient payroll system can help to enhance employee moral and boost your reputation, mistakes in record-keeping and compliance can result in punitive penalties– even lawsuits. Of course, no business wants to expose itself to such financial and reputational risk. However, keeping up to date with payroll legislation can be a complex task. It’s reported that as many as one in three small businesses are penalised for incorrect payroll. To protect your company from costly fines and even litigation, you need to stay informed about employment laws, reporting rules, and changing workforce compliance issues. 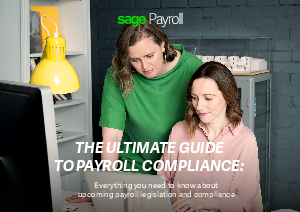 In this guide, we look at the challenges and the payroll solutions that will help your payroll department meet its compliance requirements with confidence including the GDPR.